New Game Designed to EVOKE a Better World tells about several projects involving game playing that Jane McGonigal is leading. These virtual reality games are designed to solve difficult real life problem and make real life changes. This excellent article by Kim Pearson also contains video of a recent TED Talk by McGonigal, which is a must-see. Aviary continues to grow and improve. It’s now available in Google Docs. This is good news for educators, as this video shows. Aviary is readying an education program. If you’d like to be a beta tester for this education program, sign up here. Don’t put hints inside text boxes in web forms from UX Matters give some excellent reasons why you should stop teaching anyone to do this, if you still are. 5 Things You Can Do with Aviary Screen Capture at Web Worker Daily gives a good summary of a new feature of Aviary. I’ve written about Aviary before in Updates on Aviary and An Early Look at Aviary. Smashing Magazine put together a nice handout for your classroom. An HTML5 Cheat Sheet in PDF format. First point to make about this image editing and pattern making online app is that it’s free. I spent a long time just playing with the home page, which responds to mouse movements, before I even signed up and took a look at the tools. It uses AIR. I already have AIR installed on my computer, so Aviary didn’t ask me about downloading and installing it. I’m assuming that if I hadn’t already installed it, I would have been directed to do that. It also uses Flash, but the presumption these days is that pretty much everyone has Flash installed. From the dashboard, you can view other people’s work, collaborate on something, go to the forums, or select one of the two main editing buttons from the upper right: Image Editor or Pattern Maker. I started with Image Editor, which Aviary calls Phoenix. My daughter is named Phoenix, I could hardly start anywhere else, now could I? In addition to the two that are up for testing now, there are a number of other tools on the way such as Hummingbird–a 3D modeler, Starling–a video editor, and horus–a font editor. The image editor opens in a new window. When it opens, you can select a new image or start from scratch. Take note of the familar looking image editng palettes on the right with blend mode and history. The top palette is contextual. Sometimes it shows layers or properties. On the left are tools such as selection tools, paint tools, shape tools, and text tools. In the bottom left corner, there’s a switch foreground/background button. Anyone who has used Photoshop, Fireworks or Paint Shop Pro will feel right at home with these familiar icons and palettes. I go with Start from Scratch and accept the default image size and transparent background. I open the shapes submenu, select a rectangle, and click the color box to choose a new color. When I click OK, the shape is placed on the workspace. I can move it around with the transform tool, which would also let me perform various other transformations. I add a gradient background, a reddist rectangle, and a star. I throw some smudge around the edges of the star with the smudge tool. I add some gears, some text and decide I’m finished. The text tool was hard to work with. There were limited fonts. I also noticed, when looking for help with the text tool that the help files aren’t populated yet. I’m sure this will be fixed before Aviary reaches a public state, so I’m not worried about it. I save. I’m asked for a title, but don’t get any choices about where to save. When I close the editing window, I see the image saved in the My Images area I reach from the Dashboard. I double click the image and it opens in the window shown immediately below. Here, I can reopen it in Phoenix, copy some code to embed it elsewhere, or insert information related to the image in forms at the bottom of the page (barely visible in the screen shot.) One of the settings allows me to say who can edit the image—everyone or no one. An options shown in the screen shot above is URLs to Embed and Share. One is This page. the other is on the Aviary Forums. Here’s the URL to embed this page. If you visit the page, you find a comment box, but you must be logged in to comment. Because I was logged in to this page, there is also an “Open in Phoenix” button, but this wouldn’t be available unless a) you logged in, and b) you had premission to edit my image. 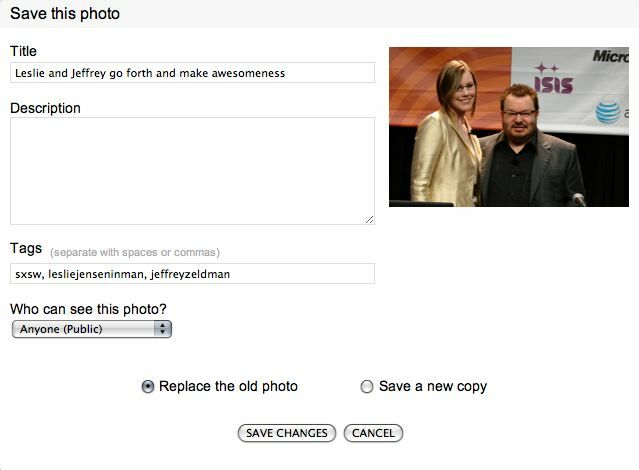 Another important function found in the My Images area of your account is the ability to upload images from your computer. When you upload, you can set viewing permissions and and editing permissions. Now for a look at the Pattern Maker, which Aviary calls Peacock. I don’t have any daughters named Peacock, but it was my aunt Elizabeth’s maiden name. They’ve given their tools whimsical names, but I’ll be I remember these two. Here’s the Peacock editing screen. The tools are in accordion panels on the left. At this point, several of the tools use the same icon. These tools are nothing like what you might be familiar with from Photoshop or Fireworks. As I understand it, the tools are to make patterns that you intend to repeat or tile. The blog entries for Peacock show some really incredible stuff made with this tool, but I couldn’t figure out how to get started. A tutorial would be valuable, and is probably in the works for all the tools. I managed to drag a generator icon for fractals onto the canvas. The active tool is connected to the image by a line–why I don’t know. Although I tried to apply some of the effects and use the controllers among the tools, I couldn’t figure out how to use them. I saved and left this page editable by everyone, so if you can figure out the pattern maker better than I did, feel free to do some editing to this image. Just leave a comment about what you did. Other features of the site include setting up friends and favorites among the other imagery artists on the site, and being able to access your friends and favorites from the dashboard. At this point, with only two tools online, I feel I hardly scratched the surface of what Aviary is going to be able to do in the hands of a creative person. They have a long ways to go to reach the point of public release, but I have a feeling this is going to become one of the most important creative tools on the web.